Police investigating a murder are asking for men aged over 17 to come forward so they can be eliminated from the enquiry. Nearly two years after the murder of Valerie Graves, police say they are just over half way through taking DNA samples from 5,000 men in Bosham. On 30 December 2013, 55-year-old mother Valerie Graves was found brutally murdered in her bedroom in Smugglers Lane, Bosham. She had been staying at the property while the owners were away over the Christmas period. Forensic scientists obtained a limited DNA profile for the murder suspect, which was not clear enough for a search on the National DNA Database, but indicated that the suspect is male. Sussex police launched the biggest voluntary mass DNA screening in its history early this year, asking for all men aged over 17 who live, work or visit Bosham to provide a DNA sample and a thumbprint so they can be ruled out of the inquiry. DCI Jason Taylor said: “This investigation remains a priority for the force and we are determined to find Valerie’s killer and get justice for her and her family. “This time of year is particularly difficult for her family and friends. We are asking for people’s understanding as we continue to knock on doors in Bosham and ask for DNA samples. 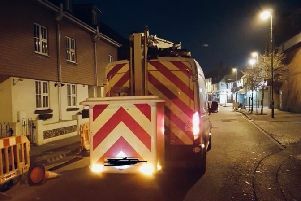 “I would ask any men aged over 17 who live, work or visit Bosham who haven’t provided a DNA sample to contact police so we can arrange for this to be taken and for them to be eliminated.